Should states or private seed companies regulate price of Bt cotton seed? Three state governments are waging a legal battle against the seed industry over prices of Bt cotton seeds. Andhra Pradesh, Gujarat and Maharashtra have cases running in the state courts with the National Seeds Association of India for fixing prices of Bt cotton seeds. The association questioned the state governments’ authority in fixing prices, saying it would hamper seed research in the private sector. It says only the Union government can set the prices. In 2006 Andhra Pradesh set the ball rolling by fixing its own price of Rs 750 for a 450 gramme packet of Bt cotton seeds. The prevailing rate of seeds then was Rs 1,800 (see ‘Monsanto at the receiving end of Bt cotton pricing policy’, Down To Earth, July 15, 2006). Gujarat and Maharashtra followed Andhra Pradesh in 2008 and 2009. The three states say they need to defend the farmers’ interests—the states account for over 70 per cent of India’s cotton production as per India’s Cotton Advisory Board. An official in the Andhra Pradesh agriculture department said the state was forced to fix a price because the private seed companies’ price for Bt cotton was unaffordable. Why are Bt cotton seeds expensive? The bone of contention is a royalty price for the patented Bt genetic sequence. The companies charge a royalty of about Rs 150 on a packet of 450 gramm-es of Bt cotton seeds, said G V Raman-janeyulu, executive director of the non-profit Centre for Sustainable Agricult-ure in Hyderabad. In several countries, royalty is within 10 per cent of the wholesale price of goods, he said. Seed companies in India usually charge more than 20 per cent as royalty—since 2002. Ramanjaneyulu supported the Andhra government’s decision to fix royalty charge of Bollgard I at Rs 50 and Bollgard II at Rs 90, saying it reduced the price of the seed for the farmer significantly. Bollgard is the trademark under which Bt cottonseeds were introduced in 2002. Companies argue seed prices constitute merely 7-9 per cent of the cost of cultivation of cotton in India. “Today, five million cotton farmers in India choose from over 300 hybrid seed varieties from more than 30 competing seed companies, plus non-Bt cotton seed varieties,” said Uday Singh, president of the seeds association. The income of cotton growing farmers has increased because of higher yields from better hybrid seeds and increased support prices by the government, he said. The association also claimed their products led to savings of Rs 2,250 per acre from reduced pesticide usage, and that Bt cotton farmers were earning an additional Rs 8,669 per acre. They referred to research by the Indian Market Research Bureau in 2007. Its study concluded that hybrid cotton farmers earned 64 per cent higher income (Rs 8,669) per acre than conventional seed farmers and 67 per cent of them repaid their long-pending debts. The seed companies said their profit margins were decreasing because of high input costs. 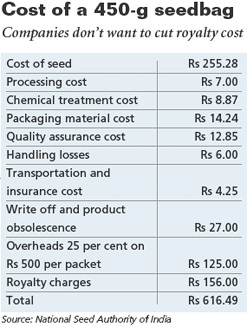 Companies say their prices reflect several costs they incur: seed processing, chemical treatment, packaging, quality assurance, transportation, insurance and the royalty (see table). The cost of labour has doubled in Andhra Pradesh over the past three years, said Singh. Besides, prices of most seeds like paddy and sorghum increased 41 to 120 per cent between 2006 and 2009, while the prices of cotton hybrid seeds decreased 13 to 43 per cent, said Singh, pointing to the drop in price of Bt cotton seeds from Rs 1,600 in 2002 to the current Rs 650. Continuing price controls would be detrimental to food security, farm productivity and farmer incomes,he said. Ramanjaneyulu did not buy these arguments, saying cotton prices paid to the farmers are still very low. Prices at which farmers sell cotton may have increased marginally, but farmers have not made much profit from cotton over the past decade.